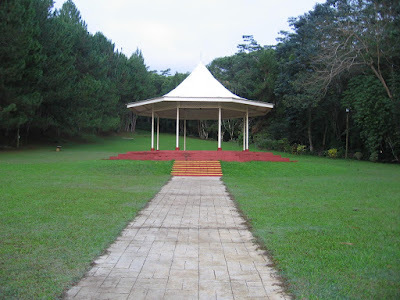 MEET ME AT THE GAZEBO! This place reminds me of some scenes from the the movie The Wedding Planner. Happy Sunday everyone. .....Heaven awaits for me ... so goes the song. 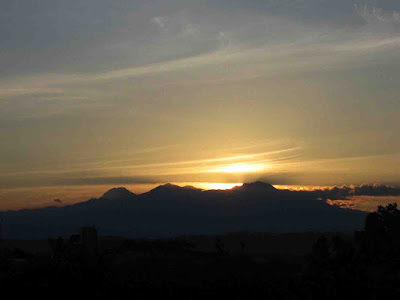 Folks, this is yesterday's sunset seen from my workplace. That's the glorious Mt. Apo crowned with the twilight sun. 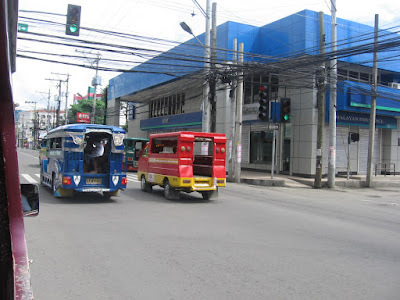 You are seeing an intersection of CM Recto St., and Palma Gil St., two of the major thoroughfares of Davao City, while I’m proudest to say that our city is green and clean not with the wires that stretch above the roads. Eagle’s Café deck at the Philippine Eagle Center in Malagos, Calinan, Davao City. 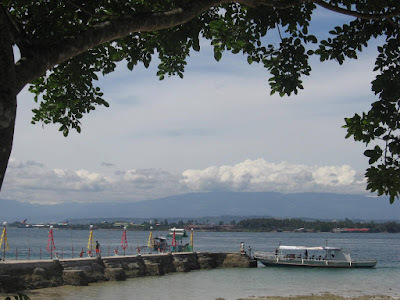 Davao City is know as the Durian (Durio zibethinus) Capital of the Philippines. 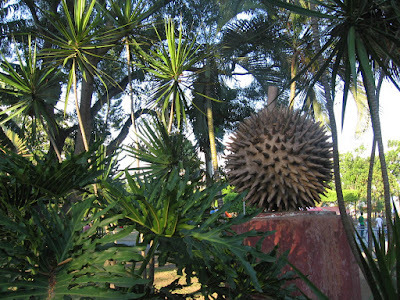 This durian replica is found at Magsaysay Park here in the city. 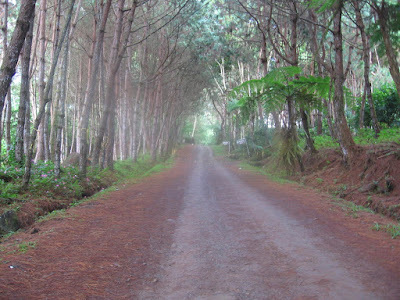 one of the scenic road stretches at Eden Nature Park. 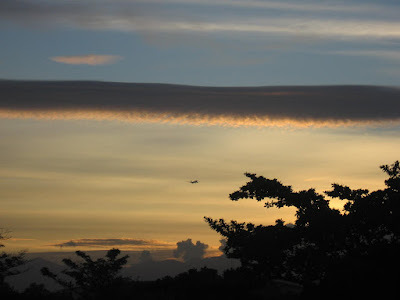 One of my sunrise sky shots when we were in Eden Nature Park here in the city a month ago. The sky bullies to drop all these and eventually did, we just stayed in our cabin the whole morning. 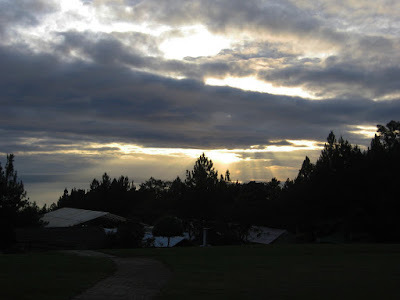 See more of the world's beautiful skies here. My mom brought us recently several kilos of Japanese corn. 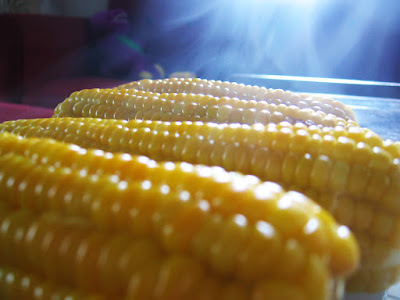 This variety of sweet corn is really yummy to the bite as it is not as firm as the sweet corn normally sold along the sidewalk. But I wonder if these are genetically modified, no labels, nobody questions, nobody cares and everybody eats. 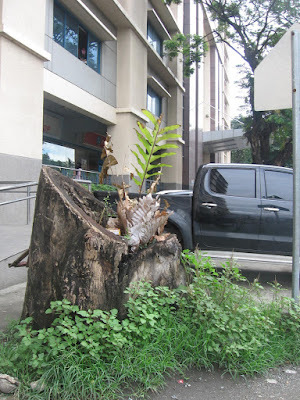 To question whether genetically modified foods are safe to eat is least of every Filipinos problem, I wonder if some are even are aware that there are food of this kind that are hazardous to health. 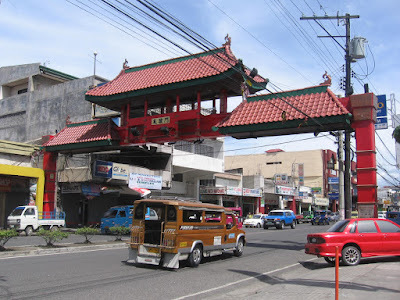 A Chinese peace archway built to commemorate the peaceful coexistence of the Chinese and other culture in this city; this is at the delta of Oyanguren St. that marks the start of Davao City’s China Town. 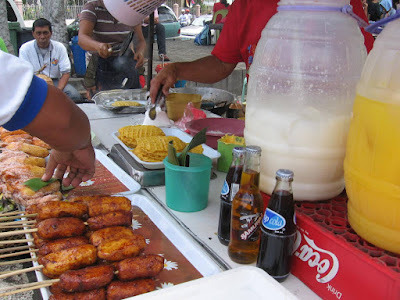 Maruya (banana cue) fried banana, energy drink, softdrink, orange juice, buko juice these are just few of the many choices you can find in a typical Davao street food stalls. 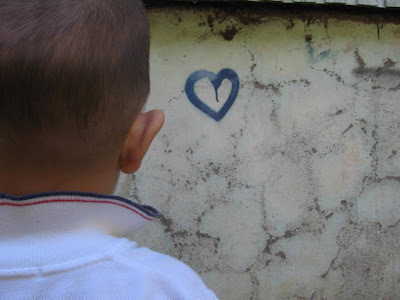 Not all hearts are red some are blue, well, literally... LOL! Some random scenes I have around with my son. Happy Velentine's Day everyone and thank you for checking Anything Davao. A window to paradise, that's how I best describe this shot. 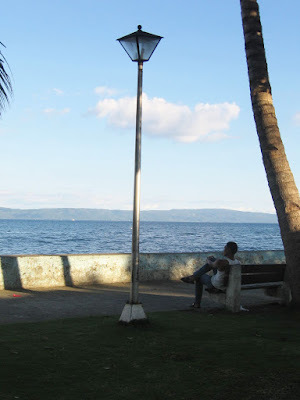 I took this from a window in one of the resorts in Island Garden City of Samal. I don’t find this guy lonely, but I love the way he just sit alone, think and have a time of his own. I have to shut off my shutter’s sound for him not to notice me clicking on him from the back. 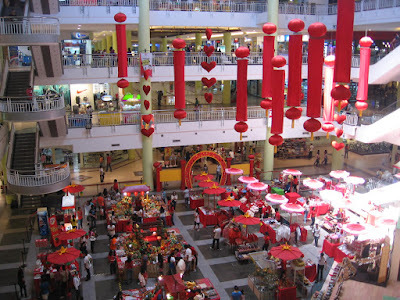 Valentine's decor at the atrium of Gaisano Mall here in the City. Commercial stalls take advantage of the occasion to amass profit. The small red stalls you can see sells good luck charms, others food and some Valentine goodies. 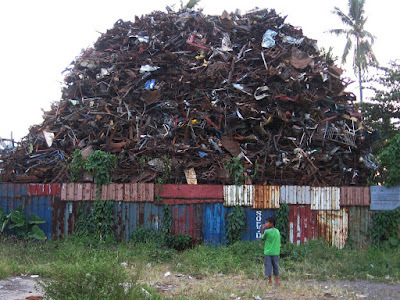 This is a mound of metal scraps I pass by everyday going to work. I just hope we can find smarter measures to efficiently reduce, reuse and recycle our wastes not just this metal scraps but the eternally problematic human dependence on plastics. 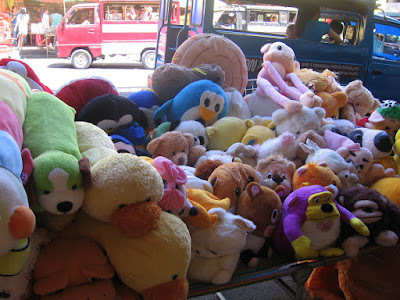 Every Sunday these stuffed toys are lined along Oyanguren St. waiting for adoption. 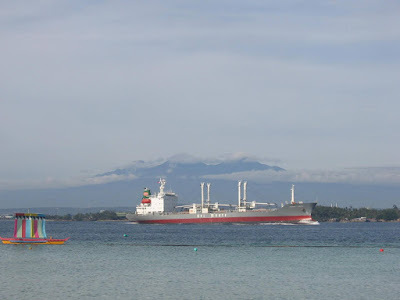 These are 'ukay-ukay'(second-hand) stuff coming from South Korea, Japan and mind you they came in huge container vans, I wonder where Davao City will put all these junks in case nobody fancies to buy them. 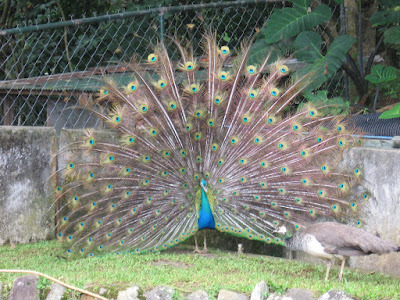 Blue Peacocks (Pavo cristatus) and peahens are just few of the startling attractions of Eden Nature Park here in Davao City. 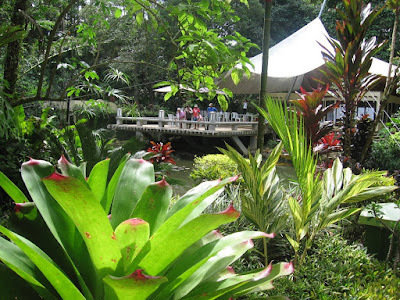 If you happen to visit the city include in your itinerary this nature park, it’s located at the foot of Mt. Apo. When we were there, I was lucky to capture this peacock courting a peahen. An interplay of culture and nature. The background is the highest mountain of this country, Mt. Apo. This scene was taken at Paradise Island Resort. One of the beautiful sunsets from my favorite spot in my working place, luckily I spotted a plane leaving towards the sunset. The child is entitled to receive education, which shall be free and compulsory, at least in the elementary stages. He shall be given an education which will promote his general culture and enable him, on a basis of equal opportunity, to develop his abilities, his individual judgement, and his sense of moral and social responsibility, and to become a useful member of society. The best interests of the child shall be the guiding principle of those responsible for his education and guidance; that responsibility lies in the first place with his parents. 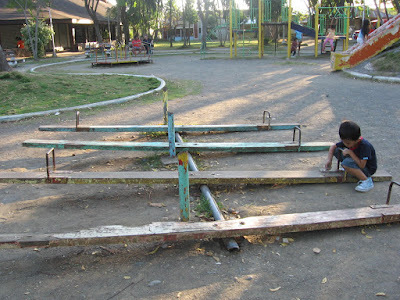 The child shall have full opportunity for play and recreation, which should be directed to the same purposes as education; society and the public authorities shall endeavor to promote the enjoyment of this right. Verdict: VIOLATED, The picture tells all. 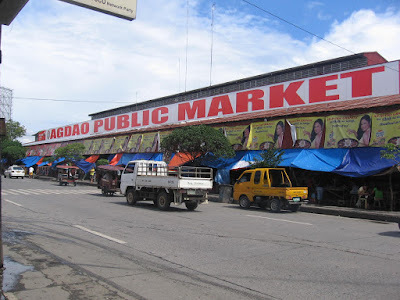 This is where I do my marketing every Sunday, dubbed as the cleanest public market in the city. If I have to enumerate the benefits of a tree then it would be an essay. Needless to say this city just lost tons of it. According to the old folks here, this Acacia tree was about 40 years old when it was hacked down to give way to a modern building like this.